I logged into my SoundCloud account this evening to find my stream plastered in “Here’s the Drop” graphics on waveforms [insert mega-surprised vinyl rip here!]. Like every other SoundCloud user right now, I’m totally baffled! Here’s the WHAT?! My SoundCloud stream a moment ago. And it’s not just on other users waveforms, there’s plenty of these ugly graphics on my own tracks! My own tracks have also been hit…. A quick scan through forums and Twitter, users are noticing and there’s mixed feelings. Some believe it’s an early April Fool’s joke SoundCloud is playing on their users and find it funny… some feel like their creative work has been defiled and are furious… there’s plenty of talk about a possible hack and of course, there’s uproar that a term normally associated with Dubstep music is getting plastered on metal, rock, live recordings, video game music, etc! At first glance I thought it was a clever new gimmick SoundCloud were testing, the arrows seemingly did point to spikes in waveforms but after closer inspection I did realise it was all completely random. Personally I believe SoundCloud has been hacked this weekend. Did anyone else notice on Facebook that their newsfeed activity was completely random? My newsfeed was chocablock with bizarre memes and what not. Of course, this has all disappeared from their App page now. I tend to take SoundCloud a bit seriously, I use it every day and I prefer it to other social media music platforms (MySpace is dead! Reverbnation never appealed to me as much as I tried! Twitmusic doesn’t cut it either) and I take pride in my profile. For me SoundCloud is the cleanest, easiest and most efficient means of putting my music out there and keeping track of my stats! 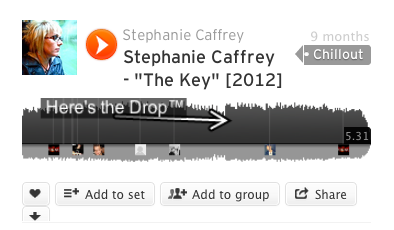 Stephanie Caffrey’s stream on SoundCloud – Hear the world’s sounds. UPDATE: It’s called the Dropometer and it SEEMS to be a gimmick! read about it here (I just hope we can remove it from our tunes cos not everyone uploads Dubstep to Soundcloud… though I still think it’s an April Fool’s joke, haha!) 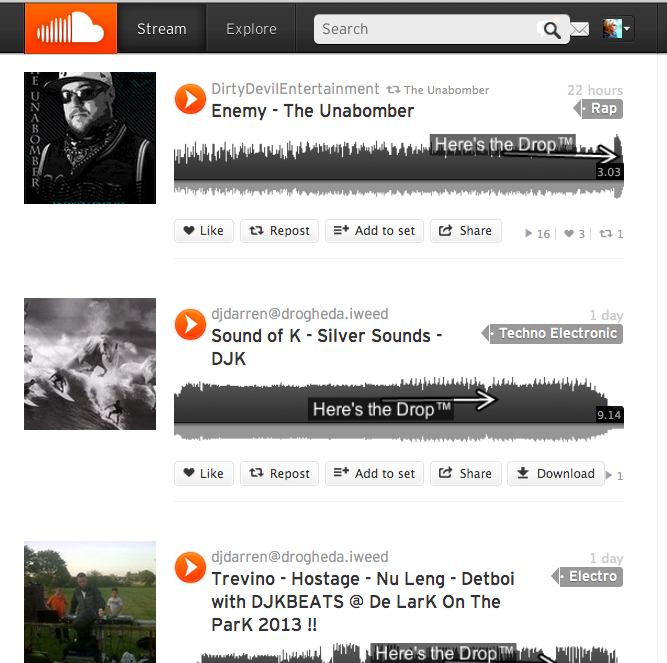 : SoundCloud » Debuting Today: The Dropometer. Previous PostHitchhiking the Galaxy For The First Time!Next PostAnother Music Production Project Tracking Completed! I think its an April fool thing…. From Soundcloud! Trying to get people talking I guess ;D Have you found any more info?? Yes, I just got my reply from support confirming it is an early April fools… .. I do like the idea of user specified points of a sound like “you have to listen to this vocal here!” etc..
Why do they have to doooo that. It’s so dumb. 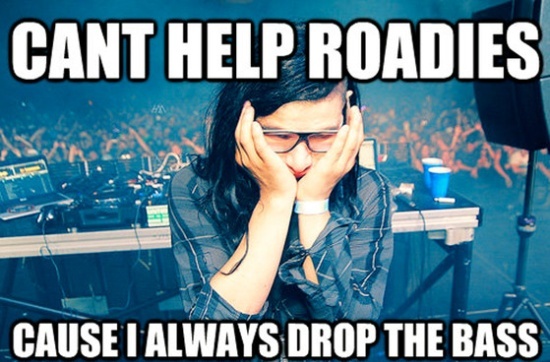 Not everyone likes dubstep. Don’t do that. not even funny…just ridiculous and annoying….worst April Fools ever….had people saying they were going to leave Soundcloud! i agree, i didn’t think it was funny myself… especially for those who pay for their premium accounts…. (I was pretty mad initially) if they wanted to play a joke they could have come up with something a bit more clever I feel!